Prior to his missionary career, Columban founder Bishop Edward J. Galvin had served in Brooklyn, New York, as a young parish priest. Even as Bishop Galvin founded the Columbans and went to China, he retained his affection for the New York City borough. By the mid-twentieth century, the Missionary Society of Saint Columban had been in existence for more than three decades. 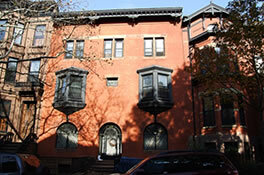 In 1950, the Columbans purchased a private residence at 869 President Street in Brooklyn, converting it into a promotional house and a “way-station” for Columban Fathers on their way to overseas missions or returning from them. The Brooklyn House officially opened its doors in May 1950, and served as a hub for the Columbans on the U.S. East Coast and elsewhere.